Whether you're traveling on vacation, just going to work, or simply wanting to organize your beauty essentials, there are many types of makeup cases available to do the job. From small, discreet bags to large, compartmentalized carrying cases, you can find the perfect storage for all your needs. Micro-Cases: Designed to hold only one item, such as a lipstick or compact, these makeup cases offer discretion and style, plus are suitable for the slimmest of purses. Many versions also have an integrated mirror for convenience. Small Traveling Cases: With sturdy zippers or latches, these cases are built to withstand the rigors of travel within a piece of luggage; but they are typically only suitable for short term travel because they cannot hold a wide variety of cosmetics. Large Traveling Cases: With a greater number of compartments and more organizational features, these traveling cases are perfect for extended vacations or trips where you will need a large assortment of makeup. The supreme designs may even be pieces of luggage in their own right, complete with luggage locks and identification tags. At-Home Cases: These containers are designed to organize an entire makeup collection and may feature several distinct compartments or drawers, a variety of mirrors, or coordinating application tools. They may fit in a bathroom drawer or cupboard, or there are stylish designs meant to stand alone on a dresser or vanity. Train Cases: Train cases are also designed for traveling purposes and usually have a hard exterior and multiple layers and compartments inside the case. Some train cases have wheels, like traveling cases, but most are designed to be held in the hand. Professional Cases: Professional makeup artists tend to carry a variety of different cases, depending on the job they are working on. However, many makeup artists also carry professional makeup aprons to hold their supplies. This allows makeup artists to have makeup and tools on them at all times. Most women will have several types of makeup cases depending on their specific needs and the extent of their cosmetics collection. The key to a useful case is finding the one that has desirable characteristics and works best for your individual needs. Casemetic: These cases come in a variety of bright colors and styles. Most cases are train cases or smaller traveling bags and cost under $40, making this an affordable option for many individuals. Japonesque: This company has a successful makeup line as well as a newer line of small cases and travel cases. These can be found at many makeup stores and online retailers. TZ Case: TZ Case is known for creating quality sports, beauty and business cases that are both visually appealing, functional and resilient. All of the TZ cases are made from hard reliable materials such as aluminum. TZ Case features a number of cases ranging from small travel cases to large traveling professional styles. 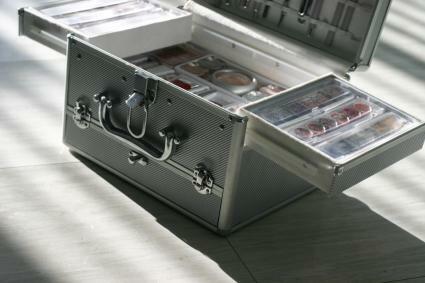 For larger cases, such as traveling cases, and higher-end professional makeup cases, consider websites such as LeCosmetique and Makeup Art, both of which carry a number of their own professional makeup cases. Both of these sites have a vast selection of products trusted by makeup professionals around the world. Different makeup storage containers are designed for different needs. Depending on the size of the case, there are a variety of characteristics that make it more useful, but women should critically evaluate each choice before purchasing one. Too many features only inflate the price of the case, without adding extra value for your particular situation. Convenient compartments (drawers, dividers, pockets, etc.) that are not too deep or narrow to hold a variety of different cosmetic products. Sturdy closures (zippers, latches, snaps, etc.) that will prevent the case from unintentionally opening, particularly if it will be stored in a purse or piece of luggage and may be handled roughly. Easy-to-clean interior surfaces, such as plastic or vinyl, that can be quickly wiped off if any makeup spills and will help prevent leaks spreading to other items outside the case. Sufficient space to store all makeup products without crowding, which can crack containers and cause spills. Be sure to account for future makeup purchases when evaluating your space requirements. Washable exterior surfaces for hefty leaks or spills. Built-in mirrors for convenient use. Straps, slots, or narrow pockets to secure applicator tools and brushes without warping or damaging them. Discreet, solid materials that won't reveal the secrets to a woman's beauty. Fabrics that easily snag or fray when encountering rough surfaces, such as the edges of makeup containers. Narrow pockets or very deep compartments that may hide cosmetics or make them less accessible. Loose latches or poor construction that easily pop open under the slightest pressure, inviting messy spills and lengthy cleanups. Hard-to-clean fabrics, deep corners, and other crevices that cannot be easily sponged in case of spills. Crowded cases lacking room for future purchases - if makeup is jammed together, the individual containers may rupture, making the products unusable. Single-compartment cases that will result in every product jumbled together in a disorganized mess, creating havoc whenever a specific item is sought. The best way to choose a suitable case is to determine what your storage and accessibility needs are and choose one that matches your requirements. If, for example, you only have a limited collection of cosmetics and you do not wear them often, a small, single-compartment case may be ideal. On the other hand, you may have a wide variety of makeup and change looks frequently, you will then need a case that offers better organization and easy access. Sturdier cases are recommended for frequent travelers, while a micro-case may be the best choice if you regularly travel with only one or two pieces. Makeup storage comes in a wide range of styles, colors, and designs, but its function is all the same: to give a woman efficient and convenient access to her beauty products while minimizing spills, hassle, and general frustration. By examining different cases' characteristics and comparing them with your anticipated needs, it is easy to find the best case for you.